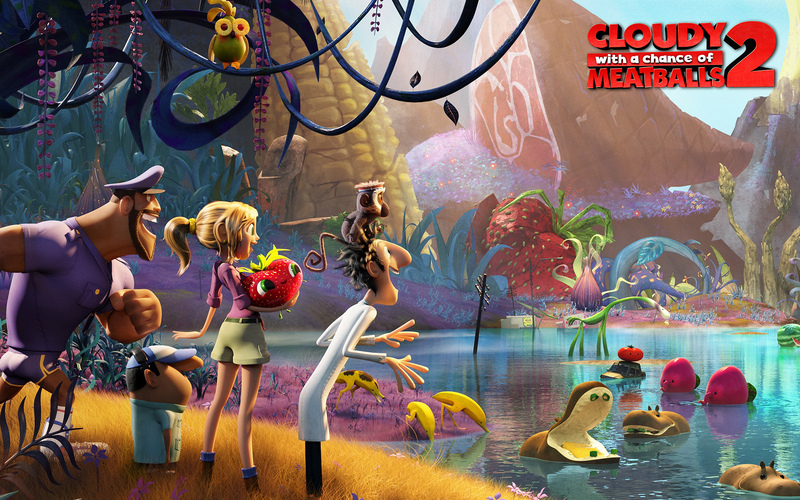 Quickfire Review: Cloudy With A Chance of Meatballs 2 (2013) – Hooray For Movies!! Synopsis: Flint Lockwood now works at The Live Corp Company for his idol Chester V. But he’s forced to leave his post when he learns that his most infamous machine is still operational and is churning out menacing food-animal hybrids. Cloudy With A Chance Of Meatballs was a brilliantly odd animated hit that at times hit levels of visual surrealism that Lynch or Cronenberg would be proud of. Smart, funny with the right level of adorable it acted as a springboard for it’s directorial team of Phil Lord and Chris Miller to go on and make the further excellent Jump Street movies, not to mention the genius Lego Movie. Sequels to hits, especially those that come from left field, are notoriously hard to land. Losing the creative team behind the initial hit should’ve been the final nail. Yet, much to the credit of all involved, Cloudy 2 manages to often, if not always, hit the high notes of it’s much loved predecessor. Picking up almost exactly where the first left off, hapless well meaning scientist Flint Lockwood (Hader) has redeemed himself in the eyes of his local community by saving everyone from the food storm he created by way of his crazy invention. Now a hero, he is recruited by his somewhat shady Steve Jobs-ish idol Chester V (Will Forte) to fulfill a lifelong dream of working at the Live Corp HQ while the island is cleaned up. All is not quite as it seems though and V evidently has bigger plans for Lockwood’s machine which is somewhere on the island surrounded by mountains of food. Six months later and with no machine V sends Lockwood back to the island in hopes he can locate it for him and kill a gang of marauding cheeseburger spiders. What he doesn’t bank on is Lockwood taking his trusty gang with him to help out. And when they arrive something beyond anyone’s wildest imagination has occurred as they are confronted with a Jurassic Park of food animals. Shrimp-anzees, Taco-diles, Apple Pie-thons and a strawberry called Barry. As they have shown over and over again in the last few years Lord and Miller are the kings of the machine gun approach to pop culture references. Incoming directors Cody Cameron and Kris Pearn understand that you don’t mess with a good thing and seamlessly mesh their style into that of Lord and Miller’s, having great fun in poking fun at the Silicon Valley LIVE Corp before really letting loose on the island with endless King Kong and Jurassic Park references. And like Lord and Miller they know when to ease off the syrup button so it never gets too sentimental, something other cartoons could learn from. Hitting that right tone does help when you have a cast of SNL regulars in your corner. Remarkably it didn’t do nearly as well as everyone thought at the box office given the love for the first one. I can only imagine it will do better on the home market. Really enjoyed this movie and I need to get me one of those cute little strawberry guys! ☺️ Barry I luv you! Great review!